Ok, these are so darn yummy! I had these years ago at the Cheesecake Factory and I’ve always wanted to try and make them for myself. These days there are so many copycat recipes out there for just about anything you’re looking for. So I looked and sure enough there were several to try. I particularly liked these and the lime cilantro dipping sauce was perfect with them. 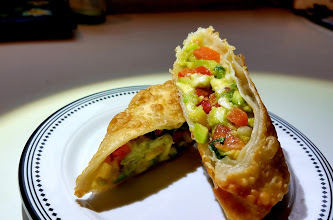 The changes I made to these were adding more cilantro to the avocado mixture. I love cilantro so I added about 1/4 cup instead of 2 TBS. I also added chopped sweet red pepper (1 or 2 TBS.) and about 1/4 cup sweet corn. Adjust amounts to your liking. You could also add black beans. I fried them in Avocado oil and they came out beautiful. I hope you enjoy these!! We loved them!